Fluorescence in Situ Hybridization is used to visualize defined nucleic acid sequences by hybridization of complementary probe sequences. FISH has many applications, from basic gene mapping to the diagnosis of chromosomal aberrations (Cytogenetics). Analysis of multicolor FISH images requires isolation of the various signals either with individual filter cubes or an excitation filter wheel in combination with multiband dichroic and barrier filters. Crosstalk in FISH and Densely Multiplexed Imaging. 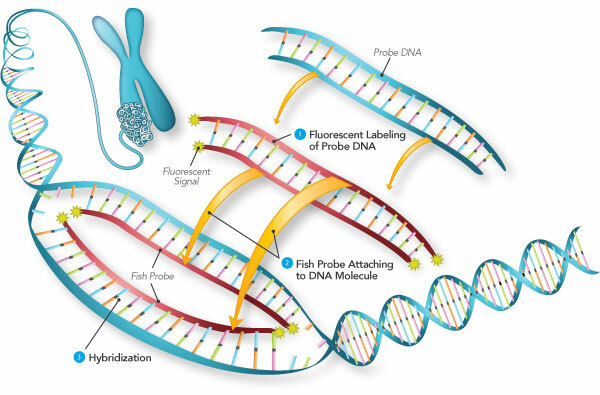 In applications like FISH that use multiple fluorophores, rapid and accurate results rely on the ability to readily distinguish the fluorescence labels from one another. Optical filters in these systems must transmit the desired emission signal with high efficiency but must also reliably block the unwanted signal from neighboring fluorophores. The bleedthrough of unwanted light from overlapping emission signals is called crosstalk. 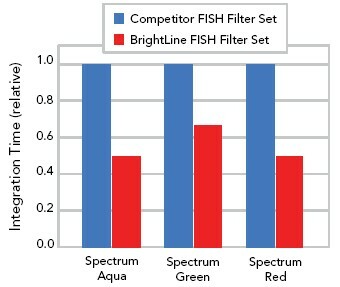 Each BrightLine® FISH filter set is meticulously optimized to maximize brightness for popular fluorophores while simultaneously minimizing unnecessary background and crosstalk with adjacent fluorophores. 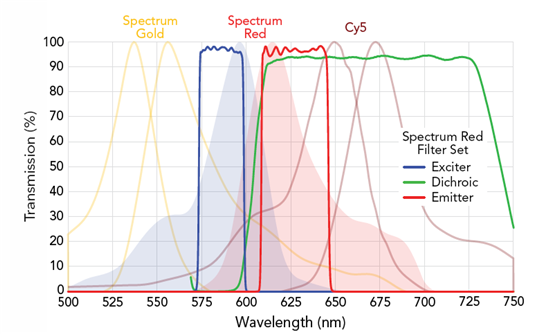 Filter spectra for the SpectrumRed filter set SpRed-B and the absorption and emission curves for the adjacent fluorophores SpectrumGold, SpectrumRed, and Cy5™ (left to right). Crosstalk values are determined from the overlap of typical, normalized fluorophore spectra, optical filter design spectra, and an intense metal halide lamp excitation. These results have been normalized for each given filter set, so users should read the values along each row (not each column) to view the expected crosstalk values for a given filter set. Do Better Fluorescence Filters Really Make a Difference? Whether you are finding and analyzing metaphase spreads or scoring cells by spot counting, independent testing shows the benefit of carefully optimized BrightLine filter sets. These benefits include higher throughput due to shorter integration time and high signal to noise ratio making it easier to score the cells. Side-by-side independent comparison using equal exposure times of images achieved with competitor filter sets (left) and BrightLine filter sets (right), of a human tumor hybridized with CEP 3 probe in Spectrum Red (part of Vysis UroVysionTM assay, 400x magnification). Photo courtesy of Tina Bocker Edmonston, M.D., Thomas Jefferson University. BrightLine filters allow shorter integration times for faster imaging – especially for automated tasks like metaphase finding. This independent industry test compares integration times required by BrightLine FISH filter sets to those of competitor filter sets. The automated system, based on a Zeiss Axio Imager microscope, found metaphase spreads with identical image intensities.